Heat olive oil in a saucepan over medium heat until a piece of garlic dropped into the oil slowly bubbles. Add the garlic, and cook and stir until golden brown, 5 to 7 minutes. Remove garlic from the oil with a slotted spoon and set aside; reserve oil. 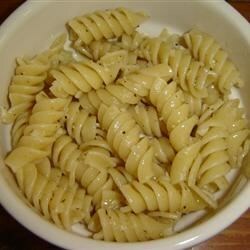 To serve, place the pasta onto individual serving dishes and sprinkle with fried garlic. Drizzle with a little of the frying oil and sprinkle with Parmesan cheese. Reserve remaining garlic-flavored oil for another use. very good for a side dish. served with chicken and pasta complimented it perfectly. I did not care for this recipe....followed the recipe to a tee and was so overbearing. I highly do NOT recommend this dish...even for garlic lovers. Loved this & so easy! I halved the reciped for just the two of us. Added a little crushed red pepper, basil and lemon juice right at the end. Love learning a new technique!